I’m pretty sure we have completely skipped the beautiful “Fall” season and have gone straight to Winter here in North Texas. It has been extremely cold here over the past week and we even got a little snow Sunday night. It’s only mid-November!! The weatherman is even saying we are going to have a “Colder” and “Wetter” than normal winter this year with above average snowfall. I honestly couldn’t be more excited. When Old Man Winter settles in to your neighborhood what are some of your favorite meals to ward off the cold nights? If I’m in a hurry I’m always happy with a big pot of soup or chili. 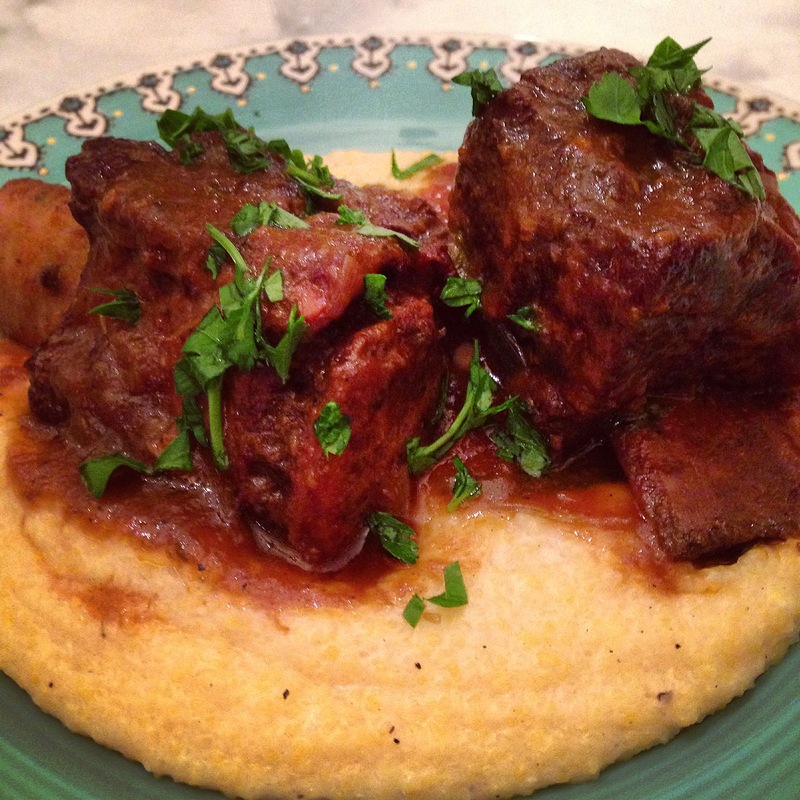 But when I have a little extra time, like on a Saturday or Sunday night I love making Braised Beef Short Ribs served on a bed of creamy white cheddar polenta. These short ribs are easy to make but like all good things they just require a little time. They cook low and slow in the oven in a delicious bath of wine, vegetables, herbs, and beef stock for 2½ hours until they are fall off the bone tender. Then I puree up all the veggies into a smooth paste to thicken the sauce (along with a little butter flour roux) and spoon that delicious sauce over the polenta and the short ribs. Heat a large Dutch oven with ¼ cup of Olive Oil over high heat. Pat the beef short ribs dry with a paper towel, the season all sides well with salt and pepper. Sear the beef short ribs in small batches, on all sides, until well browned, about 2 minutes per side. 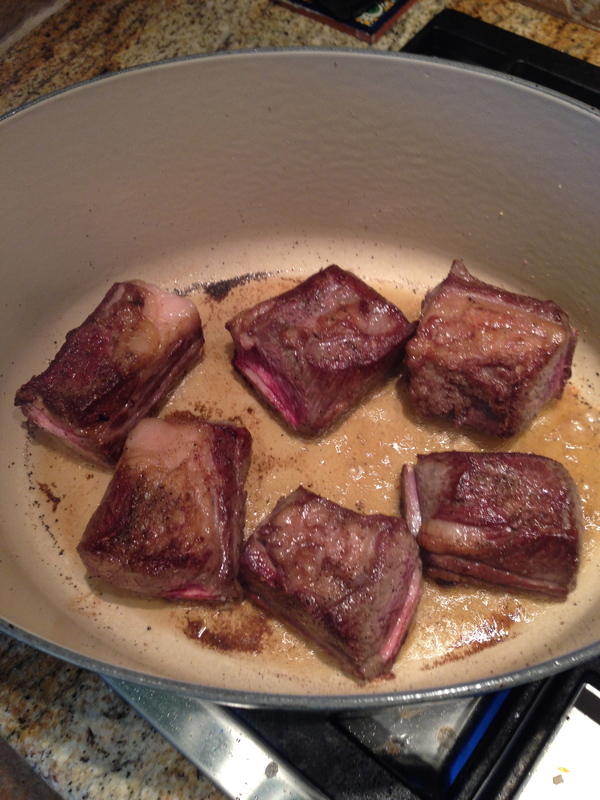 Once browned on all sides, transfer the short ribs to a plate and set to the side. When all of the short ribs have been browned drain off the excess oil in the pot, reduce heat to medium and add 2 more Tablespoons of olive oil. Sautee the chopped onions, carrots and celery, with 1 teaspoon of salt and black pepper to taste until the vegetables are tender, about 8 minutes. Stir in the garlic and tomato paste and cook for 2 more minutes. Reduce heat to medium-low and pour in the red wine, while scraping all the brown bits off the bottom of the pan with a wooden spoon. Return the beef short ribs (and all their juices) back to the pot. 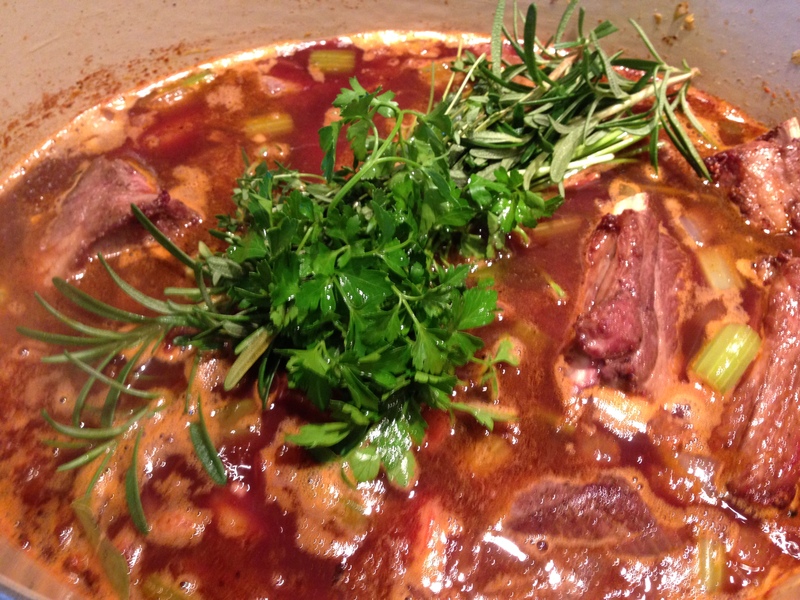 Add the brown sugar and just enough beef stock to almost completely cover the beef short ribs. Tie all the herbs (except the bay leaf) in a bundle and place in the pot. Bring everything up to a boil, then cover and place pot in the oven. Cook for 2 ½ – 3 hours at 300 degree or until the meat it fork tender. When the meat is fork tender, remove the pot from the oven. Transfer the short ribs to a large dish and cover with foil and allow them to rest. Return the pot to the stovetop and bring the juices to a boil and reduce the sauce by half. Discard the herb bundle and the bay leaf, and with a large spoon skim off as much fat as possible. With a large slotted spoon remove as many of the vegetables as possible and transfer to the bowl of a food processor, puree the vegetables until smooth. Stir in the vegetable puree and reduce heat to a simmer. In a small bowl mix 2 Tablespoons of flour and 2 Tablespoons of butter (at room temperature) to create a smooth paste. Whisk the paste into to the sauce until incorporated and the sauce begins to thicken. Taste for seasoning. Add the beef short ribs back to the sauce. Cover and simmer on low until ready to serve. In a large pot bring the stock, water and butter up to a boil. Slowly whisk in the cornmeal and continue to whisk for 2 minutes. Reduce heat to a low simmer cook for 15 minutes, stirring often. Stir in the sour cream and taste for seasoning and cook for another 5 minutes, stirring often. Finally stir in the grated sharp white cheddar cheese. The sound of this is making my mouth water! I love everything about this dish! 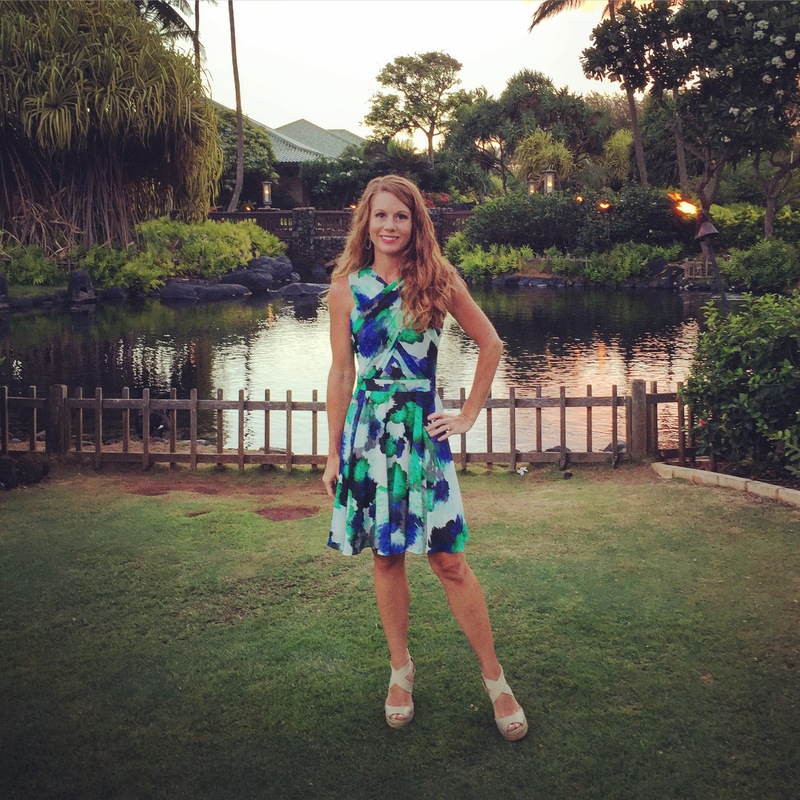 Pinning! Thanks so much Julie 🙂 !!! I do love the pacific northwest 🙂 beautiful landscapes and AMAZING seafood. My Aunt a Native Texan transplanted up to Bellingham, Washington a few years back. Thanks for the follow!! Everything is better with Parmesan cheese and butter!! I could eat a big bowl of polenta right now 🙂 I always think it’s funny because I can tell someone they are eating “grits” and they shy away but call it polenta… and they can’t get enough! !